Transition is the process that facilitates the move throughout school to postsecondary adult living. 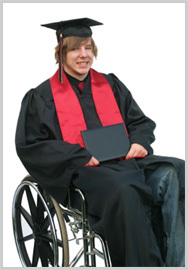 Planning the transition from school to adult life begins, at the latest, in high school for students with disabilities. Transition planning is required by law to begin once a student reaches the age of 14 (or younger when appropriate). This transition planning becomes formalized in school as part of the student’s Individualized Education Program (IEP). The student’s needs, interests and preferences must be considered in the planning and students are therefore strongly encouraged to take part in the IEP meetings. The student and their family are expected to take an active role in preparing the student to take responsibility for life once school is finished. After students leave school, they will need to organize their own life and navigate their way through a maze of adult service providers. This can be a daunting task, one for which the student and family need to be prepared. The full collaboration of the student, family, educators and community service providers is needed for successful transition. The planning process helps to ensure that the students participate in making decisions related to areas of education, medical, employment, social, and daily living needs. The Family Guide to Secondary Transition Planning for Students with Disabilities, is highly recommended for all students and families to download and review to understand the transition process. There are several state and area agencies that provide services to individuals with disabilities assisting with job training, post-secondary options, and other critical needs. Please visit FLDOE Division of Vocational Rehabilitation for more information. Family Support Center on Disabilities: Florida Developmental Disabilities Council, Inc.